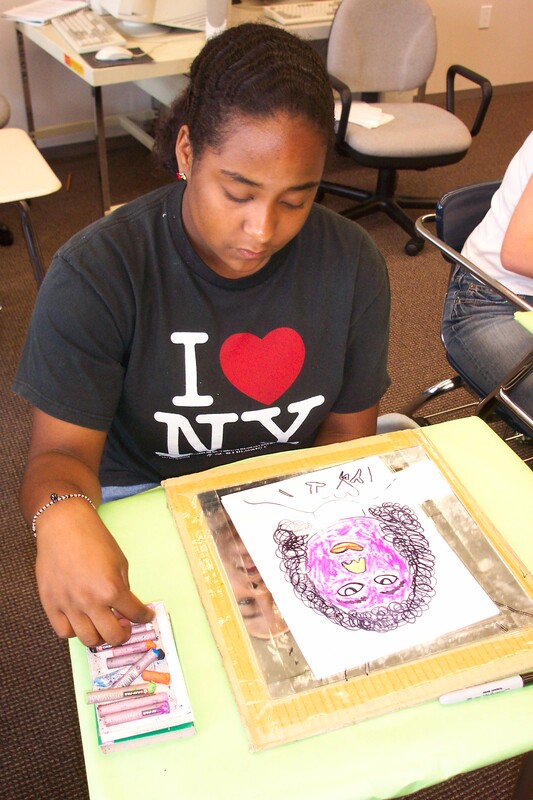 The WITS Meeting House project unites creative writing with inspired drawing; hundreds of students, working with WITS teachers, created self-portraits, and 158 of them now reside on the Flickr site. One portrait that I especially like was drawn and painted by a girl named Chelsey. It’s simple, yet striking: the hair is a sensible, realistic black, but the face is purple, the nose green, the neck blue, the eyes pink. A corona of colors surrounds her face. Red, yellow, and black, among others, make an appearance: the colors of the rainbow, but in a muted, somewhat discordant key. They colors been thickly drawn, so that the grain in the mark left behind by the colored pencil can be seen. I am never sure, when viewing these pictures, how much of the final creation was intentional, and how much was accidental. The ambiguity resonates with me; I can relate to it in my own work, when the features that people like in my writing often seem like errors to me, while the parts I labored over escape without mention. Taken as a whole, one senses the struggle between the artist’s vision and the artist’s powers in the thick lines and rough edges of the Meeting House picture set. Swirl the curls atop my head with a black, dark and rich, like crow’s feathers. The simple, perhaps unconscious aesthetic choice to make the hair the one realistic color in the face makes it click for me. I’ve never met Chelsey in real life, but I like to imagine that if I did, that raven-black hair would allow me to spot her and say, you look exactly like your picture. Note from the Editor: It is interesting that out of over 150 student self-portraits that make up The Meeting House, Julian chose Chelsey’s. He does not know Chelsey, but she has attended WITS Summer camp for the past 12 years and will graduate from HSPVA this month. She is an amazing writer, and I suspect that the artistic choices made in this work flowed from her many years of creative experience. This weekend Chelsey will receive a scholarship from Alpha Kappa Alpha, and she will attend college in the fall. Congratulations, Chelsey! We are so proud of Chelsey. She is truly our shining star!